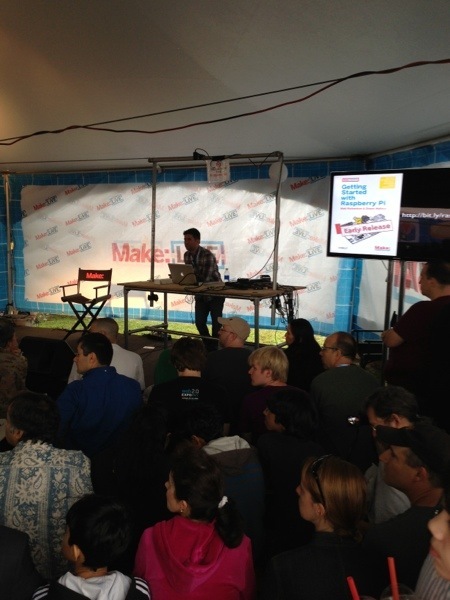 Matt Richardson: Raspberry Pi 101 – World Maker Faire « Adafruit Industries – Makers, hackers, artists, designers and engineers! A tremendous crowd presses into the Make:Live tent as the rain begins to hammer those not luck enough to be under shelter. No one races away because this is a crowd hungry to hear Matt’s protips. He tells a few great stories new to the crowd here, the beer brewing projects at Pumping Station One, the Kindleberry Pi, and shows some creative cases created by the community. Matt took time to recommend the many resource that Adafruit offers both for Pi’s and training via the Adafruit Learning System. He shared a sneak preview of the cover of his upcoming book “Getting Started With the Raspberry Pi” that he is writing with Shawn Wallace. He also emphasizes the value of using python to accomplish projects with a Pi , an area that Adafruit will be addressing with the Raspberry Pi IDE.